This past summer, I had the opportunity to check out a new zombie film from South Korea, it had been garnering a lot of buzz and I was curious to see if it would live up to the hype. The movie is called Train to Busan and it more than lives up to the hype. The film turned out to be an amazingly executed zombie film that delivers the action and also carries a strong emotional hook. It ramps up a little slowly, but it gives us characters, characters that are interesting and make us invested in their survival, or lack thereof. Train to Busan is an exhilarating example of taking a familiar story and making it feel fresh. It starts off a little to the slow side, but keeps building and building with relentless fashion, until it has you hooked and on the edge of your seat. There was action, blood, and a great deal of heart. What really makes the movie work so well is the balance of action and horror with the heart and emotional pull. It is not always an easy combination to get, but this film gets it. 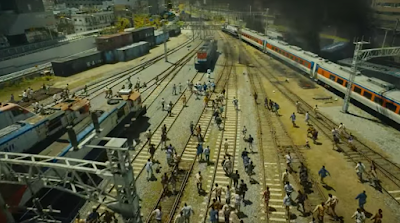 Train to Busan is a special film. It is a movie that draws you in and holds you in its clutches all the way through. It takes the fact you are familiar with the formula and uses that to toss in the human story, the drama, the real reason to watch and just keeps you on the edge of your seat. It is a truly fantastic zombie film that deserves to be seen. The movie is presented in a ratio of 1.85:1 and it looks pretty good in this transfer. The film was shot on digital and was mastered in 2K. Colors are generally solid throughout and the detail is relatively sharp, giving the ragged bloody zombies a nice look. The audio is provided in a couple of tracks, Dolby HD 5.1 and 2.0 tracks in the original Korean as well as English. The effects and sound immersion is excellent. The only real drawback are the dubbed English dialogue which does not sound all that good. So far as special features go, we get a trailer and a couple brief behind the scenes featurettes. Nothing terribly exciting. Fortunately, the movie really is good.